S.W.R.D. Bandaranaike stands stall, looking into the ocean beyond, a determined and stoic expression carved into his face set in bronze. His statue, larger than life yields an overwhelming shadow over all those who pass Galle Face Green, 57 years after he was assassinated. This iconic statue sculpted by famed Soviet sculptor realist works, Lev Kerbel was gifted by the USSR government to Sri Lanka in 1976, in remembrance of the late Prime MInister who had played a key role in establishing diplomatic relations between Sri Lanka and the Soviet Union in 1957. With the demise of Bandaranaike in 1959, his wife Sirimavo Bandaranaike became Prime Minister in 1960 and she carried forward the policies of Bandaranaike which also included a close friendship with the Soviet Union. 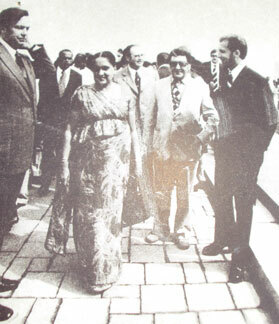 Despite Bandaranaike's close relationship with the Soviet Union, he did not have the opportunity to undertake an official visit to the country and it was Sirimavo who developed the relationship further with two official visits to the Soviet Union; the first in 1963 and then again in 1974. It was during her second visit, that the idea of an SWRD statue came up. At that time, the Soviet Union used the gifting of statues to Third World countries and to countries in the Soviet Bloc as an effective diplomatic tool to further strengthen their influence in the region. The immense task of the statue was given to the then Soviet Minister of Culture, and he in turn commissioned Lev Kerbel, who was the official sculptor of the Soviet Union to accomplish the task. Sri Lankan architect, Suren Wickremasinghe who had previously studied for his degree in the Soviet Union, was also assigned to the project. With his assistance, Kerbel started to sculpt SWRD Bandaranaike's bronze statue in Moscow. Their goal was to make Bandaranaike appear larger than life, in order to symbolize his fiery spirit and foresightedness. The biggest challenge Kerbel faced at the time was that his government had promised to deliver the statue to Sri Lanka in time for the 5th Non-aligned Conference which was scheduled to take place at the end of 1976 in Colombo. They were racing against time but given Kerbel's skill, they managed to finish it within a record time of two years. Renowned Sri Lankan sculptor and Dean of the Faculty of Graduate Studies, University of Visual and Performing Arts, Prof Sarath Chandrajeewa, the only Sri Lankan to apprentice with Kerbel recalled that he first met Kerbel when he gave a lecture at the Government College of Fine Arts during his 1976 visit. "I was so moved by his lecture, that I immediately switched my major from painting to sculpting", he said. According to Prof Chandrajeewa, a panel consisting of Sunethra Bandaranaike, Kumar Rupasinghe and Ven Dr Mapalagama Wipulasara was appointed to oversee the project and they made visits to the Soviet Union at the time to approve of the mini sculpture Kerbel had made of Bandaranaike, initially. They also had provided Kerbel pictures of Bandaranaike, based on which he modelled his statue. "The final model was then made in three sections; front, middle and lower parts. Then they were brought to Sri Lanka on a Russian Antonov plane and welded together here", said Prof Chandrajeewa. 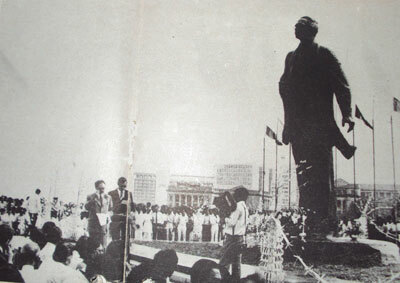 The statue was unveiled at an official ceremony at Galle Face Green on 17 July 1976. President William Gopallawa, Prime Minister Sirimavo Bandaranaike, Speaker Stanley Tilakaratne, Cabinet Ministers, Soviet Union Minister V.I Stukalin, Lev Kerbel, Soviet Ambassador to Sri Lanka, Rafeek Nishanov and other diplomats were present at the unveiling. President Gopallawa who made a speech on the occasion thanked the Soviet Union and Lev Kerbel for the statue in memory of SWRD Bandaranaike who had done much to the country. Soviet Minister Stukalin who also spoke said, the people and government of the Soviet Union gifted the statue to commemorate SWRD who took the first step to fight for peace, freedom, democracy, social progress and for having sacrificed his life in the struggle. They also remembered him for having done much to strengthen the relationship between Sri Lanka and the Soviet Union. Lev Kerbel was presented with a special memento by President Gopallawa for the statue. Kerbel, like Bandaranaike, was a controversial character during his lifetime. Born on the day of the Russian Revolution, 7 November 1917, to a Russian Jewish family in the village of Semyonovka in Chernigov (present Ukraine), Kerbel's art would revolve mostly around the Soviet Union. Kerbel's family moved to the Russian Smolensk region, where he began sculpting as a child and in 1934 won an award from the Komsomol(Young Communist League) for a plaque of Lenin. During World War II, Kerbel helped build the defences for the Battle of Moscow, then served in the Northern Fleet, gaining fame as a military artist. His other monumental statues include, the bust of Karl Marx in Chemnitz, Germany, Lenin Monument in Parque Lenin, Havana, Cuba, The "Kursk" submarine crew memorial, statue of Yuri Gagarin, a statue of two Chinese workers hand in hand in Shanghai which was later torn down when relations between the Soviet Union and China floundered. Similarly, many of Kerbel's artwork around the world were destroyed with the fall of the Soviet Union. Kerbel himself has been recorded to have said that he was always more interested in the art than the politics behind it. In August 2014,restoration work was undertaken on the statue. This cemented the position of Bandaranaike in Colombo's skyline for the next foreseeable future.